What the liberal media and many seem to be editing out, is that this was his opening to his main point that it does not make him feel good, and we need to be careful to not let our own fears violate anyone’s constitution rights. Juan responded to his firing on FoxNews.com with an excellent opinion piece that should be read. NPR firing Juan has nothing to do with his comments, but from a witch hunt attack on him for having independent thought and not adhering to their liberal point of view. NPR CEO Vivian Schiller made that clear with her cheap shot yesterday that Juan should have kept his comments “between him and his psychiatrist”. If it was a private company I would say NPR has any right to fire anyone that would feel didn’t meet their “standards”. But NPR is a publicly funded entity – relying on our tax dollars (or from healthy donations from liberal idealogues) – and if they are going to choose to stand for a political position, they should be defunded and supported privately. Juan will certainly land on his feet and I appreciate his thoughtful differing opinion on many issues. The public should support his honest debate. If NPR does not agree with difference in opinion, the public should not support theirs. Question: When is a blatantly racist comment, not racist? Answer: When its being said by a liberal, of course! Since making the comment, Ballantine has not been apologetic in the least. The Washington Times has been tracking his tweets on Twitter, and he’s been bragging about it. After the show aired, he tweeted “ok howd i do u hear me tell jaun back to the porch lmao”. He says it was not intended as a racial slur, but he hasnt clarified what he did mean by it either. What really caught my intention about the slur, was the lack of coverage is was receiving in the media. Several popular sites and newpapers (Huffington Post, CNN, NBC News and New York Times included) that love promoting racial controversy when it is coming from the right have completely ignored Ballantine’s comment. You know, the same news media that has been pushing the Limbaugh storyline for the last week? Then when a blatant case of racism comes from one of their own – suddenly their self-righteousness isnt so…righteous. Is there any doubt if a member of the right makes a comment like this they would be boycotted, protested, and ridiculed? Don Imus for instance. This double standard is what makes many not trust the organizations supposedly in charge of being an agent of truth for the general public. It is examples such as this that give the media their liberal bias label. The other question this incident brings to mind, is how much does racial pressure effect minority’s political opinions? We know Hispanics and African-Americans identify with conservative policies to a much higher degree when they arent labeled as “Republican Ideas” or “Democratic Ideas”. Does seeing someone like Ballantine essentially punk Williams on air make others refuse to openly state their own beliefs? 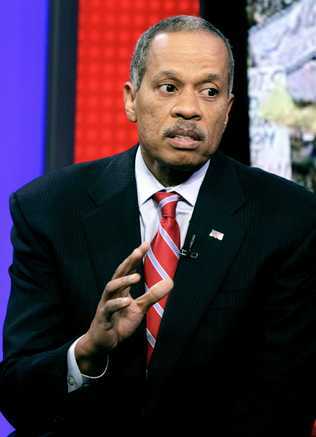 Although I dont always agree with Juan Williams I admire him for his ability to critically think about issues without following some sort of agenda. He believes in what he thinks is right, no matter what his minority leadership tells him he should believe. That’s has to be real tough.